Priyanka overtook Mayawati on Twitter on Day 1 itself. But going by the scale of her Lucknow roadshow, Priyanka will give Mayawati much more than a virtual challenge. 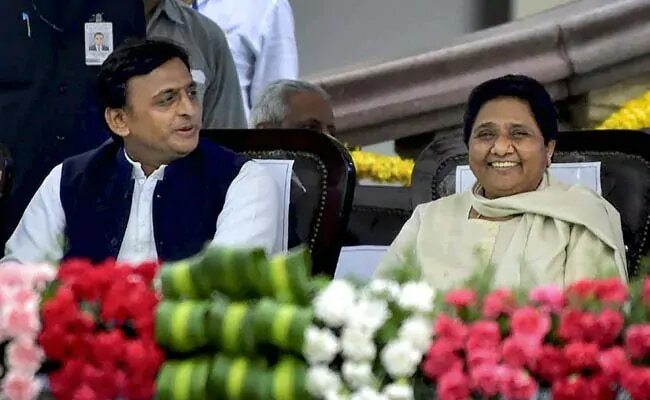 On January 12, when the Bahujan Samaj Party (BSP) and Samajwadi Party (SP) entered an alliance for the 2019 General Election, BSP supremo Mayawati was clearly in the lead in the perception battle as she addressed a joint press conference with SP chief Akhilesh Yadav. The Bua towered over the Bhatija and it was clear that Mayawati had the upper hand, even if slightly so, in this ‘alliance of equals’. This led many to speculate that if a coalition was indeed formed at the Centre, minus the BJP and the Congress, Mayawati could well be a contender for the Prime Minister’s chair. With just close to a month since, Mawayati has found a challenger — both in the rough and tumble of ground politics of Uttar Pradesh, and the virtual world. 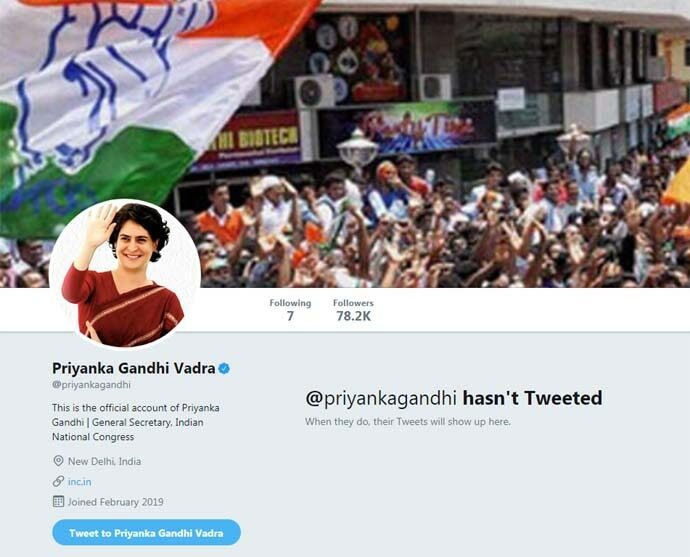 It took Priyanka Gandhi one day to dwarf Mayawati on the social networking site as Priyanka’s Twitter followers surged past Mayawati in a matter of hours. 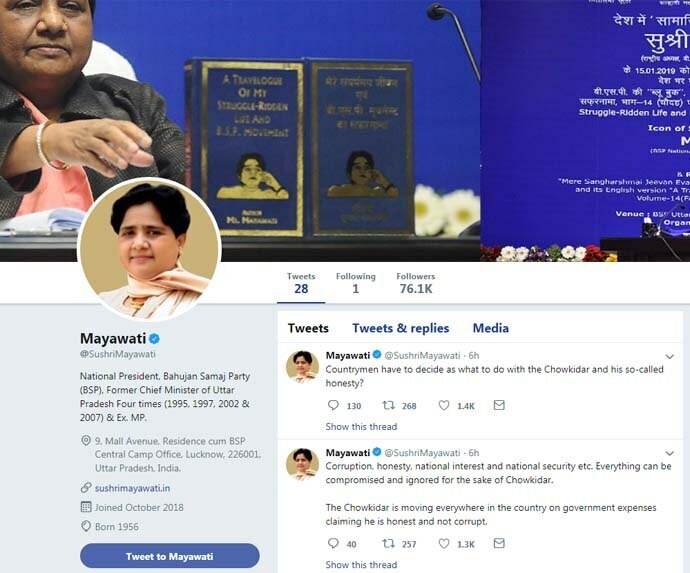 Mayawati, who made her formal Twitter debut about a fortnight ago, has 76,000 followers. On the very first day of opening her account, Priyanka’s followers stood at 77,000 (and counting). But Twitter is a far easier game to beat someone at than the rugged terrains of Uttar Pradesh — which has 80 Lok Sabha seats in its kitty. Mayawati has spent several decades learning the tricks of the trade, even devising some of them. 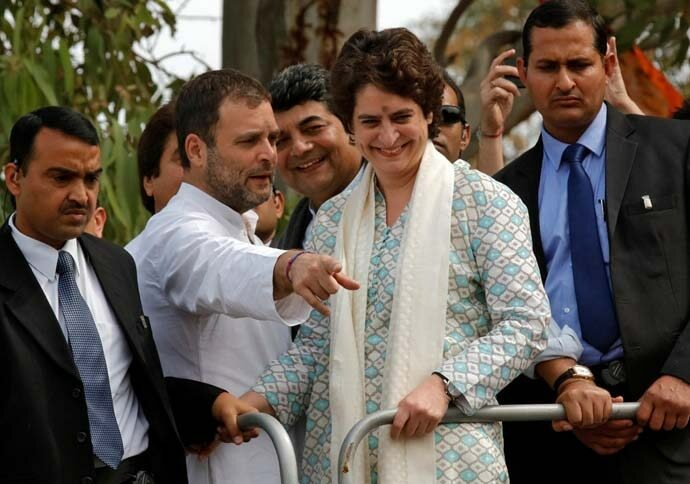 Priyanka Gandhi, who has so far only managed the campaigns of mother Sonia Gandhi and brother Rahul, is in charge of 43 Lok Sabha seats that fall under eastern Uttar Pradesh. Mayawati’s BSP is contesting on 38 seats across the length and breadth of UP. However, results of the last Lok Sabha and Assembly elections also show that Mayawati has been losing her grip over UP. In 2014, the party failed to win a single seat in the Lok Sabha election. In 2017, the party won just 19 out of the state's 403 Assembly seats. The 2018 Lok Sabha by-polls did infuse a fresh lease of life into the BSP. Even though the candidates who won the Phulpur and Gorakhpur seats were from the SP, the elections gave hope that the party could mark a comeback if it succeeds at forming an alliance. But Priyanka Gandhi’s entry into politics has once again disturbed the mathematics for the SP and BSP. 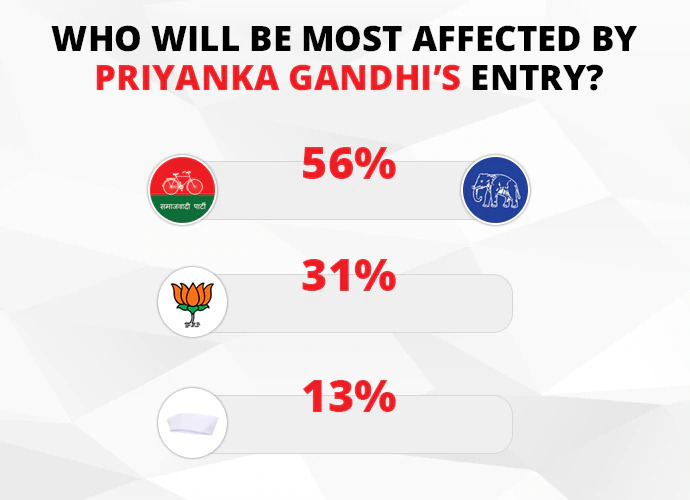 According to the India Today Political Stock Exchange (PSE), 56 per cent respondents believe Priyanka Gandhi’s presence could hit the SP-BSP alliance — only 31 per cent believe it will hit BJP. Should SP-BSP reconsider the alliance with Congress? When the SP-BSP alliance was announced, Mayawati had called the Congress a 'corrupt organisation' that did nothing for the poor, justifying it as grounds for not entering into an alliance with the party. “The Congress has not been included in the alliance because the party has ruled the country for the longest times since independence but it did nothing for the poor and the marginalised. The party only remained mired in corruption,” Mayawati had said. The SP and BSP had, however, left two seats vacant for the Congress — Sonia Gandhi’s constituency, Raebareli, and Rahul Gandhi’s Amethi, respectively. The mood has shifted since. Interestingly, it's not just Twitter where Priyanka has had an impact today. The Lucknow road show that was organised to mark Priyanka’s official arrival in UP dwarfed the hoopla created by the SP-BSP seat-sharing announcement as well. 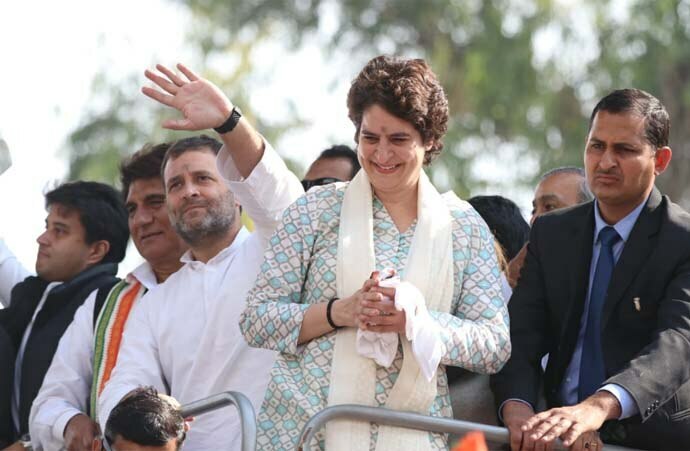 Thousands of people poured out on the streets of the city, showering flower petals on Priyanka’s cavalcade which included her brother and Congress president Rahul Gandhi, party in-charge for western UP Jyotiraditya Scindia, and senior party leader Raj Babbar, among others. Rahul Gandhi used the occasion to make it clear that sister Priyanka is not a touch-and-go politician but is in UP for a longer innings. He said the Lok Sabha election is important — but the real reason to have Priyanka in UP is to ensure that the party wins the 2022 Assembly election. A three-cornered fight is likely to hit the SP-BSP hard because the Muslim and Dalit votes are likely to get divided in such a scenario. It is for this reason that the SP-BSP need to show more humility towards the Congress and accommodate the party, lest it eats into its electoral chances. It’s been a while since Lucknow saw a rally of this scale. It sure has a message for the BSP supremo. Mayawati can ignore the Twitter contest — but now, she can’t ignore the challenger on solid ground.